The new FAST XDi Street HEI distributor includes industry-first gear technology and an upgraded module and coil that ensure clean ignition firing up to 8,500+ RPM. 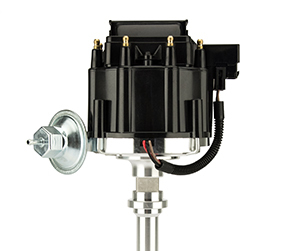 Designed for Small and Big Block Chevy engines, the FAST XDi Street HEI Distributor features a plasma nitrided gear compatible with all popular camshaft materials, including cast iron, austempered iron, 5160 steel and even 8620 steel. Plasma nitrided gears are superior to the more commonly available Melonized gears, as this special process not only increases the gear’s surface hardness but also the “slickness” of the gear teeth. This friction reduction greatly increases cam and distributor gear life. Tested to 8,500+ RPM and almost 700 HP, the FAST XDi Street HEI distributor has been proven to perform in some of the harshest street engine environments. With its upgraded 6-amp ignition module and 50,000-volt coil, it has all the spark energy needed to ensure you are making the maximum horsepower possible. While ready to run out of the box, for those who enjoy tuning the mechanical and vacuum advance mechanisms for better throttle response and fuel economy, the FAST XDi Street HEI distributor includes needed springs, advanced limit plate and instructions needed to adjust the distributor for a particular engine/vehicle combination.